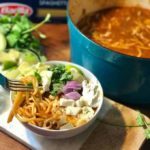 If taco soup and traditional spaghetti had a baby- this would be it's spicy, yummy, south of the border son! Top with what you please- We suggest avocado, red onion, cilantro, sour cream, and a big of queso fresco. 1 Small Bell Pepper, Diced Any Color- We used yellow. 4-5 Chicken Thighs We used bone in- but, you can use any cut really, bone in or out. Toppings- Optional, but very yummy! In a large soup pot, combine diced bell pepper, red onion, and celery with 1 tablespoon of olive oil. Stir until 'sweaty', then add 4 tablespoons taco seasoning, and stir until vegetables are coated. Add chicken thighs. Cook until chicken thighs are browned. Once chicken thighs are browned, add in 2 cans of tomato sauce, 4 cups of chicken stock, 2 cans of roasted diced green chiles, fresh cilantro, and Barilla spaghetti. Bring to a boil, and reduce to simmer for 30 minutes. Stir every 15 minutes to prevent spaghetti from sticking to pan. After simmering for 30 minutes, turn burner off, and let cool slightly. Serve with optional toppings and enjoy!